Typically, spring is the time of year when people schedule preventive maintenance for their climate control systems. For some people, though, now is the time to replace an old system that just isn’t capable of getting them through another summer. If you’re on the market for a new climate control system, you should consider installing a heat pump this spring. You’ll get a lot of benefits out of it, both during the summer and throughout the year. A heat pump looks and operates similarly to a traditional split air conditioning system, with a couple of big differences. There are two units, one installed inside and one outside. During operation, the indoor unit evaporates refrigerant to absorb thermal energy. The thermal energy is then sent along the refrigerant line to the condenser unit outside, where it is vented by condensing the refrigerant back into liquid. The main difference between a heat pump and an air conditioner is that a heat pump contains a part called the reversing valve. This valve allows the heat pump to reverse the direction that refrigerant flows through it, which enables it to offer both heating and air conditioning functions. There are a wide variety of advantages that heat pumps offer. The primary reason that many people install heat pumps is because of their ability to offer both heating and air conditioning functions. This is more than just convenient. Using one climate control system throughout the year instead of relying on the traditional two-system configuration, you can save both money and space. The savings don’t stop there, though. Heat pumps are much more energy efficient than most traditional, combustion-based heating systems. They don’t have to burn fuel to generate heat, which saves a lot of money on heating costs. This may not mean much to you now, but when winter rolls around you will definitely appreciate it. There are a couple of things that you should consider once you decide on installing a heat pump in your home. 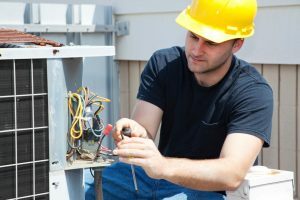 First and foremost, you need to know that heat pumps require preventive maintenance twice as often as other climate control systems. This is because, unlike those other systems, heat pumps are used year-round instead of just one season a year. This doubles the amount of wear and tear on the system, which means it needs double the normal amount of maintenance in order to stay in good condition. So, once you have a heat pump installed in your home, make sure that you schedule heat pump maintenance every spring and fall. This will grant your heat pump a healthier, longer lifespan, and grant you a better return on investment. Douglas Cooling & Heating offers a full range of heat pump installation and maintenance services in Jefferson County, AL. If you need heat pump services of any kind, contact us today to schedule an appointment with one of our expert technicians. We’ll make sure that you have the best heat pump for your needs.